In December of 1777, after weeks of drawn-out fighting near Philadelphia, George Washington and his miserable, cowered soldiers, and their families, came to Valley Forge to nurse their wounds for the winter. The mood could not have been bleaker. Philadelphia was occupied by the British. Less than a quarter of the men had shoes. The rest left bloody footprints in the snow. With their little remaining strength, they built cramped, uninsulated, wooden huts for shelter. The conditions at camp that winter were horrendous. More than 2,500 men, 20% of the army at the time, died of disease and malnutrition as they shivered, bled, and passed disease from bunk to bunk. On Christmas, they ate rice and vinegar. For some days past, there has been little less, than a famine in camp. A part of the army has been a week, without any kind of flesh & the rest three or four days. Today, the camp is the site of Valley Forge National Park, a somber tribute to the sacrifices of the men - and the families that came with them as part of the supporting army followers - to the cause of building the new nation. The trail around the park starts at the gleaming new visitors’ center and makes its way through a congested intersection, navigating its way near a high-traffic road, until it finally becomes a quiet footpath winding its way amidst the low-slung hills and rows of Pennsylvania corn. Valley Forge as an idea of what collective nationhood means is an extremely powerful one. It stands as a symbol of a group of people pooling their resources in order to overcome the adversity of the weather, medical indignities, and the lack of funds from the Continental Congress to further the war effort and create something large, together. And, as a national park, it’s free and open to the public. Most days, the path is full of couples, families, and local retirees taking in the views. Outside of the park is the present-day municipality of King of Prussia. KOP, as it’s known in the Philadelphia metro area, is a soulless corporate monotony broken up only by highway arterials, grocery store plazas, and gas stations. Not a mile from the entrance to Valley Forge is the sprawling King of Prussia Mall, the largest shopping center in the United States.. It’s with a high sense of poetic irony that one of the most important places in American history, is, of course, right next to a mall. Additions to the area have included a casino, and, most recently, a brand new “lifestyle center” development project called King of Prussia Town Center. Although King of Prussia generates a fair amount of the Philadelphia region’s economic activity, it’s less of a place people live than a liminal transit location between work and the mall. Seeing an opportunity, a local developer bought a golf course near the mall in 2003, and fought numerous legal battles to build the town center, to which both township officials and local residents were staunchly opposed. After almost a decade spent in court, including a trial that reached the Supreme Court of Pennsylvania, the developer finally got permission and construction was finished in 2017. Decorative water features and a 60-foot-long “wall of fire” to illuminate the park at night. The town center itself is laid out in an architectural pattern mimicking a small town composed of several streets, with shops lining the streets, and a central square with a public fountain for kids to splash in. All of the stores are upscale tenants like Ulta and Nordstrom Rack, and all of the restaurants have menus featuring “local” and “organic” offerings in green sans-serif fonts. There is a Wegmans nearby, and several sleek, brand-new gyms. There is an upscale beauty salon where overdressed stylists sit near completely empty chairs, playing on their phones, waiting for clients. After the congested ultra-highways lacing through King of Prussia and the miles of parking lots, it’s a refreshing change to see people walking around, small gaggles of kids playing together and running around. But, on a deeper level, it becomes obvious that the Town Center, like many things built from the top down, is soulless. At first, it’s fun to browse the stores, check out the overpriced yoga leggings and wheat grass shots. But, as you walk through the town center, you realize it was not built for people, but for corporations. 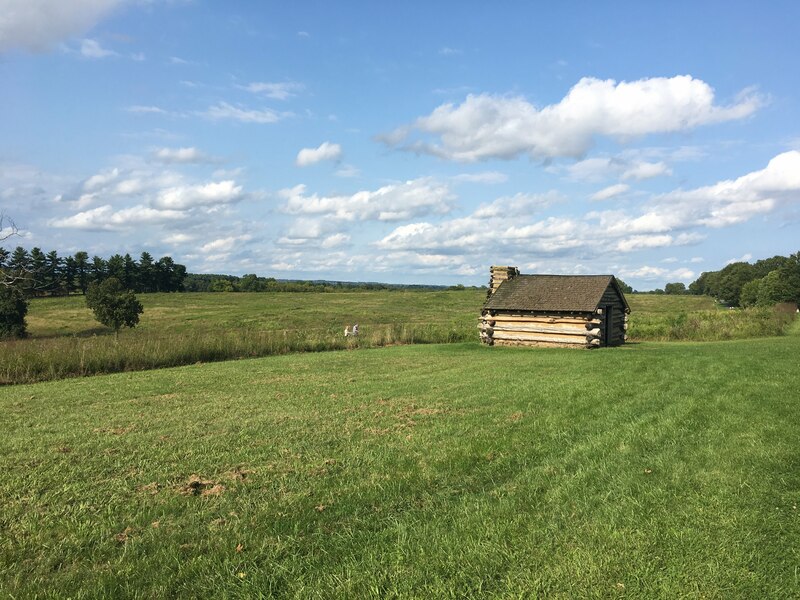 I initially wrote these observations after a visit to Valley Forge in the fall of 2017, but since then, it’s become increasingly clear that building for corporations has become a way of life in America. This July, a professor of economics argued that we should let public libraries yield to Amazon’s ruthless efficiency.. The backlash, thankfully, was swift, but the fact remains that we are yielding more and more of our public space to private undertakings, and only the lack of them can make us appreciate what they give us. It’s worth appreciating just how extraordinary libraries are, why they matter, and what they can tell us about the kinds of institutions we should build. They’re spaces of absolute equality, where anyone can come, regardless of financial resources, to study, learn, and hang out. You don’t have to purchase anything in order to get to sit in them, you don’t have to be means-tested or background-checked. They give the same things to everybody, and there’s something beautiful (and increasingly rare) about that. The King of Prussia Town Center is a fantastic example of what comes about when we get rid of public space built with public interests first in mind. It didn’t come about like most towns do - organically, first, with the original settlers planting roots, then establishing shops, the aforementioned libraries, places of worship, hospitals as the need for them arises. It was designed from the top down by developers whose goals were, first and foremost, to maximize revenue from retail space per square foot. What would it really feel like to live in a society where almost every single thing is privately owned and priced? Walking around urban Japan, I feel like I am seeing a society that is several steps closer to that ideal than the United States. Many green spaces are private and gated off (admission is usually around $5). In cafes, each customer must order something promptly or be kicked out; outside your house or office, there is basically nowhere to sit down that will not cost you a little bit of money. In the town center, there are no playgrounds, no libraries, and no civic centers. No public spaces. But, unfortunately, it’s exactly these kinds of public spaces that we as a society need more of. We need to be able spend time with each other in public parks, without the pressure of having to buy anything. We need to be able to spend time in libraries, in squares, in civic centers, talking to each other. Which brings me to our online spaces. Over the past five years or so, the public places where we conduct conversations online have become landfills of burning trash heaps, dotted by a few freak accidental discussions of clarity where both parties come away having learned something. How did our online spaces get to this point? There are many reasons that have to do with the economics of Silicon Valley and how human nature plays out at scale, but an important one is that we no longer have open public online spaces for discussion that are not geared towards revenue maximization. The goals of our largest public spaces in America are orthogonal to what humans need for communication, the same way the Town Square is kind of for you, but mostly for the stores. Both Twitter and Facebook, the largest offenders, have tried in half-hearted ways to make spaces more amenable to people staying in them by “increasing user engagement” for some vague definition of what engagement means. Unfortunately, these attempts are initiated by product managers and C-suite executives, who, like the architects of the Town Center, don’t even use their own platforms in the same way most users do. Twitter has, inexplicably, decided that instead of creating a community where most people feel comfortable sharing thoughts and not being attacked by spammers and harassers, it would increase the character count under the guise of “language flexibility”, thus breaking the main feature that made it so attractive in the first place. Facebook is led by an executive who doesn’t seem to understand human emotions, as evidenced by both the memes comparing him to a robot and the fact that he thinks Facebook is a social net positive. The funny thing is that both Facebook and Twitter already provide value to people. Just look at how many people have gotten jobs and met friends through Twitter, or been part of local communities on Facebook. But, the problem is that these things are intangible and extremely hard to measure, because they are extremely complicated, extremely long-tail, and extremely human. As long as success is measured by only the length of time people stay on the site and click on things, without any differentiation as to whether these things make people happy or sad, these platforms will not fulfill the basic human needs of real community 100%, and will continue to build towards empty, upscale shopping malls blaring music. Just look at Twitter. It already has a TV that no one watches in the sidebar. How do we fix this? There must be a way to make these platforms work for people without dismantling the “late-stage” capitalism that so many denounce these days, and without having another revolutionary war to bring us all in alignment on civic responsibility. It’s clear after the election and Facebook investigation, that there is a lot of the same type of energy that people want to channel into random acts of civic kindness. Unfortunately, we sure have spent a lot of it chasing Russian bots instead of larger systemic issues that too much time on social media causes: disengagement, alienation, and distance. First, I think one of the largest issues today is that, instead of taking these things and talking about them in the real world, we’re still trying to fix the world by implementing 280 characters and feed improvements. Let’s channel that energy by investing in and supporting in existing physical public spaces, the ones that are local to us. In my own town, there is an effort to fundraise for a playground, and buying a couple painted plates that were put directly on the playground was more tangible and real than anything I’ve done online in the past couple months. The offline action doesn’t have to be anything as drastic as quitting the internet forever and living in a yurt. It could be simple, little things like donating to local charities, going to local parks, making friends at local libraries. We’ve gone so far out into cyberspace that we now need to reel it in a little. Second, we need our groups of engagement to get much smaller and more effective. To an extent, some people are solving this by moving to group chats, Slacks, and Mastodon. All of these are invite-only, which is important. But we also need to resurrect things that made small-scale, ad-free communication possible: RSS readers, forums, and blogs. And, finally, we need to build from the ground up, not the top down online. This mean being vocal about what we want and don’t want in social media platforms, criticizing the media where they get things wrong, and building things on the internet that we want to see, that are not shaped entirely by what Google, Facebook, Twitter, and Amazon are ok with. These are all tiny, tiny solutions to the hole we’ve managed to dig ourselves into. They’re not easy, and they’ll take as long to get going as it’s taken the ad-based internet to evolve. In the age of media and internet oligopolies, where every media source is dependent on Facebook and Twitter clicks to continue fueling their content and everyone else is dependent on Facebook to remember birthdays, it’s unrealistic to expect that a small, grassroots movement can change a lot, or even anything, but that’s what they said about the Continental Army, too.